Twitter is one of the main social media platforms for promoting businesses, which is why it can do great things for you online. It targets audiences all over the world and is a news network that’s updated every minute of the day. It’s great for communicating and receiving feedback from users about your business. But Twitter and businesses can have a love-hate relationship. And although it can be a great platform, it has its downsides. 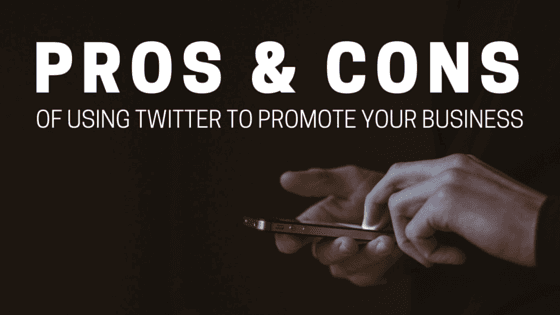 Here are some pros and cons of using Twitter to promote your business to help you decide whether or not to join in. Pro: The news feed is in chronological order and is highly interactive. Twitter’s chronological feed is straightforward. The order of your followers’ feeds can tell them exactly what your business is doing at that time. They are able to see the time you post, who likes it, who retweets it, and who tweets back. Pro: It’s an easy way to promote your brand. Being on Twitter increases your brands’ online presence and lets you create relationships with followers. You can promote your brand by tweeting your business’ story, which lets your followers see what you’re all about. You can also share information about your products and services, while balancing that out with helpful information that shows your expertise. Pro: It lets you reach new potential customers (from all over). Twitter has users all over the world. It allows people from different places to meet in one place and communicate. This social networking allows you to go beyond your bubble and reach out to people who can become your customers. Con: It can be very technical for someone who isn’t familiar with it. Twitter can be very confusing for people who are new to it, which is why some find it difficult to navigate. Twitter has its own language with terms such as “favorite,” “tweet,” and “retweet,” so it can be hard to keep up. Con: You are limited to 140 characters. Twitter limits posts to 140 characters, which means you have to keep things short. As of May 2016, Twitter announced that they are bending the rules a bit by not including photos and usernames in the count — but you may still find it difficult to share what you want to say in such a limited space. Con: It can be a waste of time if you’re not using it correctly. Twitter can be very time-consuming because in order for your posts to stand out in people’s feeds, you must post regularly. There is a crazy amount of content being shared on Twitter, so you need to commit to updating it frequently. If you just post every once in a while, you’re probably wasting your time. Need help managing your company's social media? We're here to help! Call us at 844-207-9038 or email hello@mopro.com to learn how our social media management tools can make things easier for you online.